Sarajevo’s urban core was established with the construction of the Emperor’s Mosque and the neighborhoods on the left bank of the Miljacka River. The merchant and trading center, which the Ottomans encountered on the right bank of the river, was expanded to encompass bazaars for its artisans and is now known as Baščaršija. During the 16th and 17th centuries, Baščaršija was the largest trading center in the central Balkans and today it is the historical core of town and also home to numerous attractions, serving as the epicenter for traditional handicrafts and culinary offerings. It was Isa Bey Ishaković who built the first objects in Sarajevo’s old čaršija, along with the city’s greatest benefactor, Gazi Husrev Bey, who, from 1521 to 1541, built the mosque, haneqah and bezistan that bear his name, as well as the clock tower, Kuršumlija Medresa, Imaret (public kitchen), hundreds of shops…. Of all the inns and caravanserais from that time, Morića Han is the only one to survive and visitors are taken by the unique architecture which exudes the special atmosphere of a place where, in centuries past, travelers and merchants from all over the world used to meet. Many mosques were built in Sarajevo during the Ottoman period. 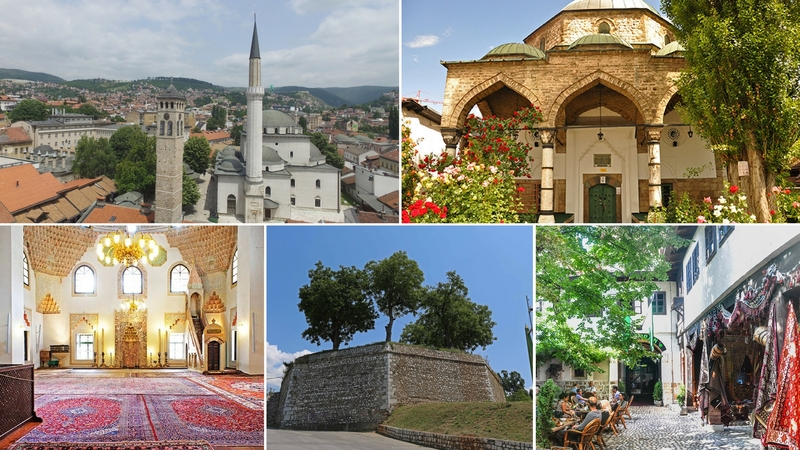 There are the more massive constructions like Gazi Husrev Bey’s Mosque, the Emperor’s Mosque and Ali Pasha’s Mosque, and the more intimate ones such as Baščaršija Mosque, Ferhadija, Bakr Baba's, Bakijska, Čekrekčijina…. The clock in Sarajevo’s Sahat Kula is the only one in the world that makes use of lunar (à la Turk) time, which is how the time for the daily Muslim prayers is determined and, according to this method of timekeeping, a new day begins at sunset. At one time, there were hundreds of sebiljs (kiosk-shaped public fountains) in town, and the only fountain of this kind that still remains is the one designed by Wittek on Baščaršija Square. It is, by far, one of the most recognizable symbols of Sarajevo. Visitors usually like to “catch” a view of Sarajevo from one of the vantage points above town and most are thrilled to walk up to the wall of the old town, Vratnik, which was constructed around this neighborhood above Baščaršija after Eugene of Savoy attacked Sarajevo in 1697, pillaging and burning as he went. The Vratnik fortification had five bastions (tabijas), two of which remain – Bijela Tabija and Žuta Tabija (Jekovac). During the holy Islamic month of Ramadan, it is a tradition for a cannon to be fired from Jekovac, marking the end of the daily fast. The only section of the fortified wall to remain fully intact is the part between the two gate towers, Ploče and Širokac, both of which are part of the Alija Izetbegović Museum. Stećci, stone grave markers which pre-date the Ottoman period, can be seen in Sarajevo. Some are real medieval works of art and the most famous one is the Zgošćanski Stećak, which can be seen in the garden of the National Museum of BiH. Many objects around town point to Sarajevo’s interesting history and the rich culture of the people who live here. One is the Old Orthodox Church, Sarajevo’s oldest sacral building, which is dedicated to the holy archangels, Michael and Gabriel. It is presumed that the church was built in the middle of the 16th century and that there was an even older church here before that. The many centuries of Jewish life in Sarajevo are testified to by the following structures: the Old Temple, which now houses the Jewish Museum; the Old Jewish Cemetery, which is one of the largest Jewish cemeteries in Europe; the Novi Hram Gallery and Ashkenazi Synagogue, as well as the Sarajevo Haggadah, which is kept in the National Museum of BiH. With the arrival of Austro-Hungarian administration, many multi-story, Western European-style buildings were built in town, along with monumental structures such as Sarajevo Vijećnica, a world symbol for the meeting of civilizations. This building served as the seat of city government and was built in the Pseudo-Moorish style, representing a fusion of Eastern and Western architecture. 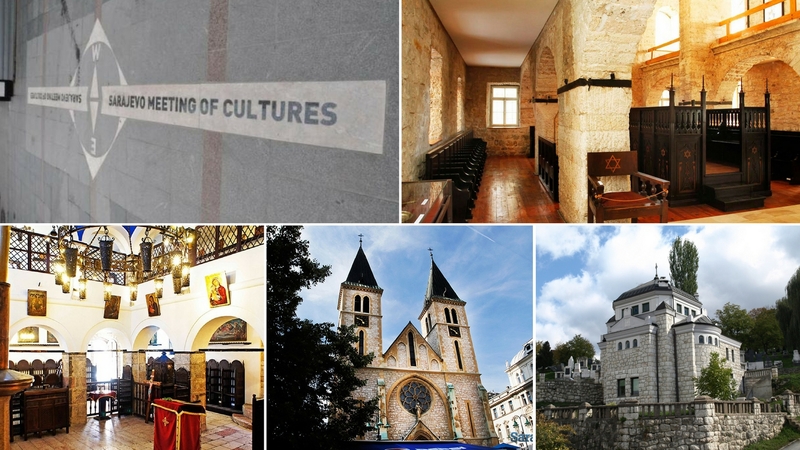 The meeting of East and West in Sarajevo is best experienced in a spot called “Sarajevo Meeting of Cultures”, where the Oriental charm of Sarači Street runs right into Ferhadija Street, with its grand Western style. The Church of St. Anthony of Padua was built in 1882 and was the only place of worship for Catholics until the completion of the Cathedral of Jesus’ Sacred Heart in 1889. The number of Evangelical Christians grew markedly after Austro-Hungarian occupation and this created the need for a new Evangelical Church, so one was built in 1899. It was also one of the loveliest buildings in Sarajevo and is now home to the Academy of Fine Arts. There is an attractive pedestrian bridge in front of the Academy of Fine Arts which was built in 2012 as part of a project by students from the Academy’s Department of Design. The aim was to create a new symbol of the city and there is a twist in the center of the bridge, a symbol of a gate, which is a traditional element of Bosnian architecture. One passes through the helix shape, from the city center, to reach a place that is reserved for art. 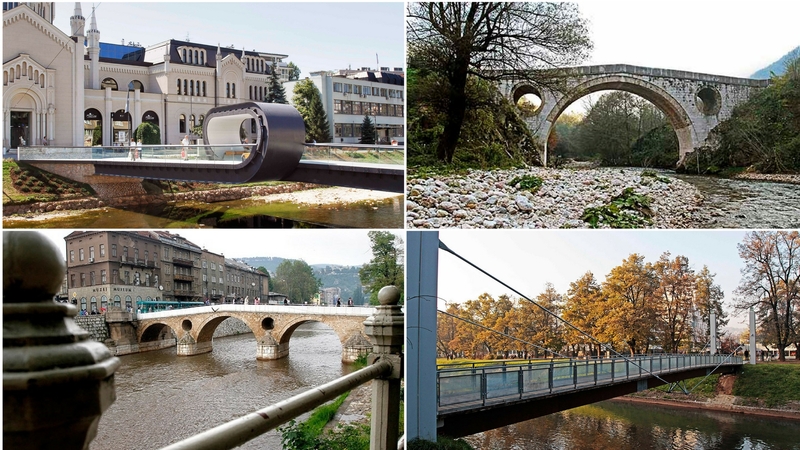 There are interesting stories about Sarajevo’s other bridges. Kozija Ćuprija is the only bridge on the Miljacka River dating from the Ottoman period that has survived fully intact. It was built in the 16th century on Carska Džada (Emperor’s Road), a road that ran all the way to the seat of the Ottoman Empire – Istanbul. Latinska Ćuprija is located in the old part of town and was a silent witness to the Sarajevo Assassination. As such, from 1918 until 1993 it was called Principov Most, after the assassin, Gavrilo Princip. This incident, which took the life of the Austro-Hungarian heir-apparent, changed the course of world history and led to the outbreak of World War I and the break-up of the Austro-Hungarian Empire. It could be said that the events which took place on Suada and Olga Bridge, which is located between the neighborhoods of Kovačići and Marijin Dvor, marked the end of BiH’s socialist era. It was here that Suada Dilberović and Olga Sučić were killed on April 5, 1992. They had both participated in the anti-war protests and they are considered the first of many innocent victims killed during the last war. Not far from this bridge is Ars Aevi Bridge, a pedestrian bridge that connects the banks of the Miljacka River near the National Museum of BiH and the Historical Museum of BiH. This bridge stands near the future site of the city’s museum of modern art and was designed by the famous Italian architect, Renzo Piano, who will also be designing the museum. Sarajevo is a city with a turbulent history, and over the course of the past 150 years it was part of eight different states: the Ottoman Empire, the Austro-Hungarian Empire; the State of Slovenes, Croats and Serbs; the Kingdom of Slovenes, Croats and Serbs; the Independent State of Croatia, the Socialist Federal Republic of Yugoslavia and an independent Bosnia and Herzegovina. However, the greatest number of preserved monuments in Sarajevo date from the period following the Second World War. Valter is buried in Vraca Memorial park, which surrounds the old Austro-Hungarian fortification built here at the end of the 19th century in the neighborhood, Vraca, on the northern slopes of Mount Trebević. While Sarajevo was occupied during the Second World War, this facility was used as a prison camp and execution site and after the war it became a symbol of Sarajevans’ resistance and their fight against fascism. Vječna Vatra is located at the point where Ferhadija, Mula Mustafe Bašeskije and Titova Streets meet. It is a monument to those who liberated Sarajevo during the Second World War and it was first unveiled to the public on April 6, 1946 during a commemorative event which marked the first anniversary of Sarajevo’s liberation. The monument is comprised of tiles that are inscribed with text and there is a copper receptacle in the shape of a wreath of bay leaves which contains an open flame that is always burning. The flame symbolizes that Sarajevo’s liberators will always be remembered. Shortly before the Winter Olympic Games were successfully held in Sarajevo in 1984, many sports and lodging facilities, such as the bob sled tracks, the Zetra Olympic Complex, Holiday Inn Hotel… were built in town and up on the surrounding mountains. The Olympics Museum and all of the other structures built for the Olympic Games testified to this great event, but they were destroyed during the Siege of Sarajevo (1992–1996). The Tunnel of Hope Museum tells the story of the longest-running siege of any city in modern history and has many items on display. From July 1993 until the end of February 1996, the tunnel was Sarajevo’s only link to the outside world. 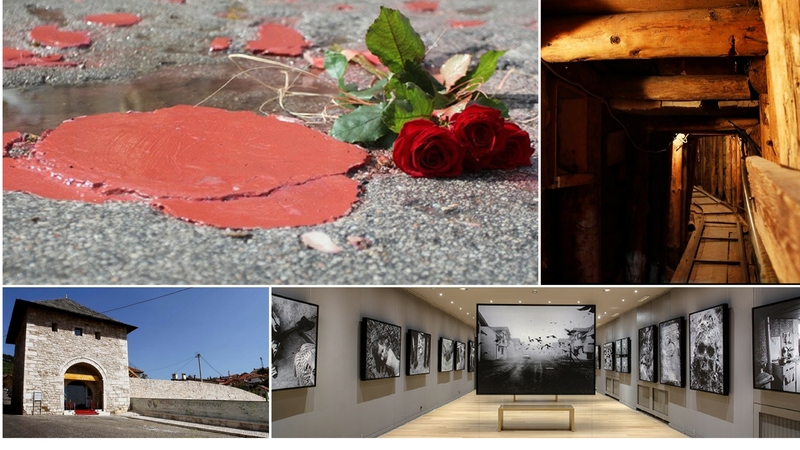 A walk along the streets of Sarajevo reveals Sarajevo Roses – marks that were left by artillery strikes and now serve as evidence of the tens of thousands of artillery shells that fell upon Sarajevo. There is a monument in the center of town, in Veliki Park, dedicated to the children who were killed during the Siege. This monument features a bronze ring made from melted artillery shell casings and two glass sculptures which represent a mother protecting her child. Two city museums are dedicated to the tragic period of the 1990s – the Museum of Crimes Against Humanity and Genocide 1992–1995 and the Memorial Gallery 11/07/95. The latter aims to preserve the memory of the tragic events that took place in Srebrenica. The graves of Sarajevo’s defenders lie in Kovači Šehid Cemetery, above Baščaršija. 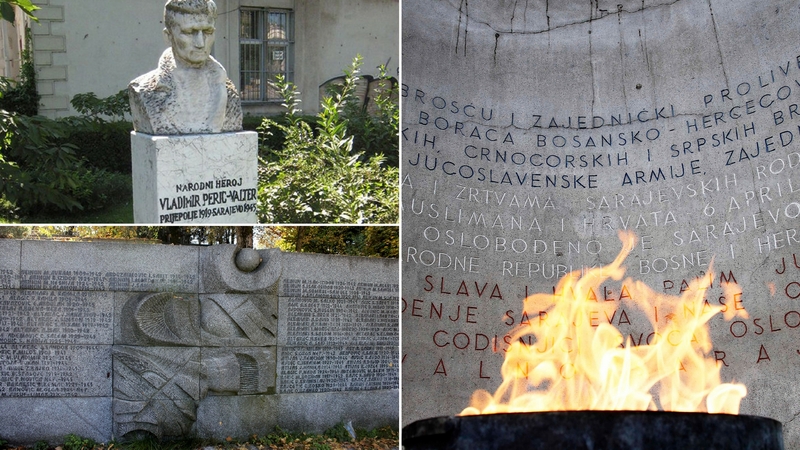 Among the tombstones is the final resting place for their commander, Alija Izetbegović, and not far from the cemetery is the Alija Izetbegović Museum, which is dedicated to the life of the first president of an independent BiH.